This is the second of this series of products and we think it will be even more popular than the HO Fence package has been. 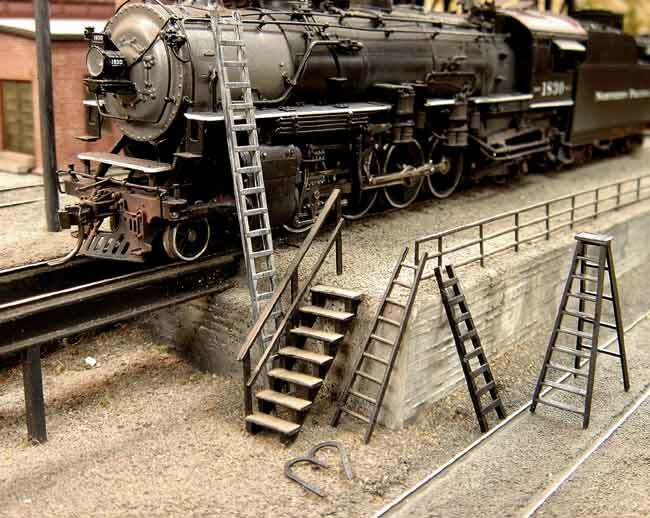 Again, the package will include (4) "sprues" of ten different step and ladder materials. This package provides an incredible value for the scratch building modeler. This item along with the fences, bridge girders, and bridge tie-sections solve many difficult or nearly impossible modeling problems for the modeler. A. Open riser stair case. Approx. 24"
B. Closed riser stair case Approx. 24"
C. Wood Ladder Stock Approx. 24"
D. Steel ladder stock Approx. 24"
J. Wood stair railing Approx. 24"